Scottsdale Police Department Lead Crime Scene Specialist Lisa Dilbeck has a bone to pick with, well, “Bones.” And, heck, what “CSI” does to advance the idea that crime scene investigating is all easy-peasy – just one or two people doing all the footwork, spraying a little Luminol and saying “book ’em!” — is itself a crime because it muddles the already murky American perception of crime-solving. Solving a crime involves a lot of experts in a lot of different fields, from science to criminal justice, doing a lot of investigating over a lot of hours in a process composed of a lot of moving parts. 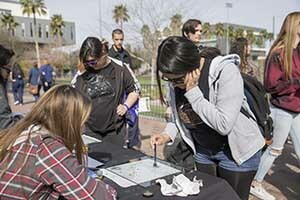 That it-takes-a-village concept was easy-peasy to see if you were one of the 1,500 high school students on Tuesday attending the College of Science, Engineering and Technology‘s Forensic Science Day, scattered around the Grand Canyon University campus. It was where high school juniors and seniors – the students on the verge of taking that big step into college – could hear talks by not only a forensic technician but by law enforcement officers, including real CSI specialist Dilbeck. They also could watch a demonstration by the Phoenix Police Department’s K-9 Unit, learn about how forensic science intersects with the law, reconstruct blood spatter, develop and analyze fingerprints, tour human anatomy and DNA labs and more. Dilbeck, who packed in the crowd at her oftentimes funny talk about how it’s really like in the field, said what you see on TV – a couple of investigators breaking open whole crimes – actually would require scores of people doing all that work. Investigators also don’t tend to use laser lights in crime scene measurements because those lights don’t show up in photographs – smoke would be needed to see the lights spanning the scene. They use something much more simple — yarn. Dilbeck talked about some of the more common crimes she has seen in Scottsdale: burglaries, persons crimes (such as domestic violence) and elder abuse. “We’re close to the border, so we have some chop shops,” she said. Dilbeck emphasized that her job is to identify and document the evidence. And, no, she said, “We don’t’ all drive Humvees,” like on the TV shows. 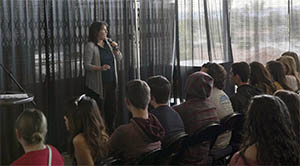 Krystin De Silva Lemieux, GCU adjunct professor and a new speaker at Forensic Science Day, was a mortuary affairs specialist in the Army before becoming a forensic technician and working with the Maricopa County Medical Examiner’s office. She told a standing-room-only crowd about what forensic technicians do, which is to assist medical examiners in their autopsies. They’re the ones who set up the exam room in preparation for an autopsy and clean the examination suite at the end of the day. They remove the organs and weigh them as well, among other duties. Lemeiux spoke a little, too, about her experience in the medical examiner’s office, which serves one of the biggest counties in the United States. Ian O’Donnell, a junior at Sandra Day O’Connor High School in Phoenix, was one of the students who attended Lemieux’s talk. Besides listening to talks, students also could stop by the blood spatter reconstruction booth. She told the students they can tell which direction blood was traveling by looking at the tails of the blood spatter, since the tails point in the direction the blood is going. Jocelyn Ogle and Elena Wolfley of Trivium Preparatory Academy in Goodyear donned white bunny suits to protect their clothing before making some spatter in a tent covered in white paper. Wolfley, who is considering a career in nursing, squirted red liquid out of a syringe, smacked a wet sponge with a bat and then dipped a hammer in the red liquid to create more patterns. She said she saw a similar activity done recently, before coming to GCU, and thought it looked like fun. Her friend, Ogle, wanted to know what liquid was in the syringe she was about to squirt. “It’s synthetic blood,” Dewey-Buchanan answered. “I just wanted to make sure it wasn’t real blood,” she said with a laugh. 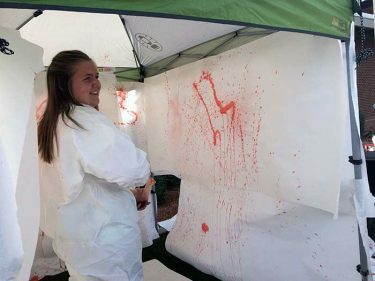 Another activity booth was the Crime Scene Challenge, where students could use their skills to deduce what might have happened to the “victim” on the lawn – a mannequin with money beside him, an empty liquor bottle on his lap, missing fingers and a gunshot wound to his head. A highlight of Forensic Science Day, which started in 2012 (a year after the forensic science program started at GCU), was the culminating event of the day, a live police dog demonstration by the Phoenix Police K-9 Unit. 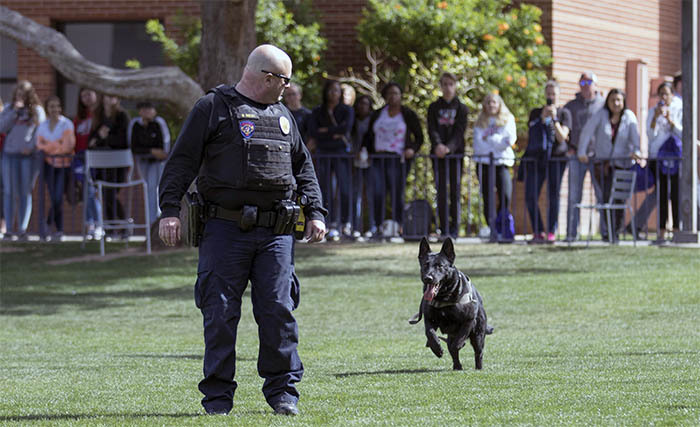 Several police dogs showed their skills, dashing across the lawn in front of GCU Arena, taking heed of an officer’s commands to stay, and then sinking their teeth into foam sleeves and bite tugs. Sgt. Rich Maiocco, training sergeant with the Phoenix K-9 Unit, told a crowd of hundreds gathered around the lawn about the dogs. The department likes to acquire them when they’re from 14 to 22 months old. All the dogs in the unit are males because they’re the size the department looks for and many suppliers like to keep the females for breeding, he said. 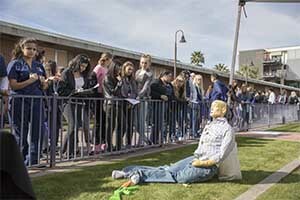 Dr. Melissa Beddow, GCU’s Director of the Bachelor of Science in Forensic Science program, said the hope for Forensic Science Day is “to recruit students, not only to GCU, but into the program.” She added that with the blood spatter and fingerprinting booths and lab tours, “we want to showcase all of the hands-on opportunities” in the field. Ricardo Cordova, the STEM (science, technology, engineering and math) coach at Sheely Farms Elementary School, said the value in Forensic Science Day is providing the opportunity for students to look at the different careers open to them in the forensic science field. He added that “in the movies, one person does all the investigating,” which the many presenters said is far from the truth. It really does take a lot of different experts in a lot of different fields doing a lot of investigating over a lot of hours in a process composed of a lot of moving parts. “That was an eye-opener for the students,” he said.